So, you've decided to test your DNA or that of another family member? Not sure how? Well, once you've decided who to test and selected the appropriate test type, ordering the test kit is quick and easy. Just follow these simple steps and your Family Tree DNA test kit will be ordered and on its way! This example will show you how to purchase a Family Finder (autosomal DNA) test kit, but you can order another test type, or order different tests for the same person (eg. Family Finder, Y-DNA and mtDNA), or even order kits for several people at the same address. From Family Tree DNA's website, select the kit type that you want to order and click on Learn More. If you want to order more than one kit or test, select one to start with, and more can be added later. Note that all amounts are in US dollars, and will be processed in US dollars and converted to Australian dollars on your credit card. The image below shows a close-up view of the middle section above. Select the gender of the person who will be providing their DNA sample, then click on the edit button and type in the name of that same person who will be doing the test. The tester's name will then appear on the front of the order box and in the cart on the right. You can then add other tests from the Add additional products list on the left, from the Add another kit + link at the bottom centre of the page, or by clicking on Add or gift another kit + in your cart on the right. If you are ordering for more than one person at the same address, there is no postage discount for sending multiple kits in one order. You may like to order each person's kit separately so that they receive their own personally-addressed envelope (this can help avoid accidental sample mix-ups). If you have a coupon or voucher code entitling you to a discount, click the Do you have a coupon link underneath the green Proceed to checkout > button, enter your voucher code in the box that appears, then click 'Apply'. Your discount should then be applied and itemised in the cart, reducing the total. When you have chosen all your kits and names, click on Proceed to checkout. A screen will appear in which you enter your billing details on the left, and the kit recipient details on the right. Ensure you enter your email address very carefully, as that is where your confirmation and myFTDNA account login details will be sent. In fact, there is space for two email addresses separated by a comma, so it is a good idea to enter a second, different email address - perhaps that of a trusted family member who is also interested in your genealogy and DNA testing. The secondary email address will also receive a copy of the myFTDNA account login and any future automated emails sent from Family Tree DNA (eg. notification when your kit is returned and when results are uploaded). The primary email address will be visible to your matches so they can contact you. You can update your email addresses at any time after ordering, from within your myFTDNA account. If you are ordering the kit for yourself and your billing address is also the delivery address, leave the billing address checkbox ticked and complete your address and credit card details. If you are ordering the kit for someone else, untick the box labelled Billing address is same as shipping address, and the right cart panel will expand downwards showing a section for you to complete the name and delivery address for the kit recipient. In the email address field, enter your email address and that of either the kit recipient or another trusted person, separated by a comma. Below is a close-up view of the expanded cart panel on the right, showing the available address fields for the kit recipient. It works very well for Australian and UK addresses. Once you have entered the recipient's address, click the green Save button shown below, and the cart will contract upwards again, but will still show you the recipient's name and address in the Ship to: section. Below is a close-up of the left side of the order screen. Terms of Service and Purchasing Policy links are below the green button. Complete your billing details and click the green Accept Terms & Complete Purchase button to complete your order. After a few seconds, a confirmation screen similar to the one below will be displayed, complete with your details and the kit recipient's details, new kit number, and order cost. Remember that the amount is in US dollars, and will be converted to Australian dollars on your credit card statement. Moments later you will receive a confirmation email similar to that below, and the secondary email address will receive the same email minus the payment information. That's it, your order is done! Now sit back and wait patiently for your little white kit envelope to arrive in the mail in approximately 3 to 4 weeks' time. 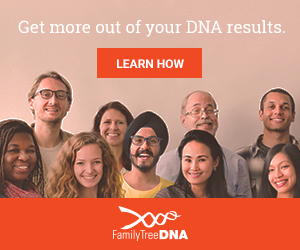 To view close-up images of the kit's contents and learn how to use the DNA test kit, read What does a Family Tree DNA test kit look like and how do I use it? While you wait for your kit, there are more DNA topics you can read about on Rev up your research with DNA - for example, setting up your myFTDNA account, uploading your GEDcom or creating your myFamilyTree, and entering your surnames and most distant ancestors. Don't worry too much about the name and gender initially, as those details can be changed later. I often order spare kits in my own name, for either gender, and change them once I know who is doing the tests. Your order confirmation email will contain the kit number and password enabling you to log into the new account. In the Account Settings > Contact Details, you can change the name (wait until you have received the kits before you change any name & address details!). Keep a note of the kit numbers and genders/tests. You can log in to the accounts to see which kit number is for which gender (via the male or female profile silhouette) and which tests you have ordered for that kit. When your relatives do the test, they fill in the green authorisation form, including their name and gender, and FTDNA will update the details with what is on the form once they receive the sample back. You can amend that later if needed (eg. change female testers to maiden names after results are released). Or you can ask FTDNA to change the gender via the Contact Us link at the bottom of their web pages. Good luck with your results, and I hope you have many volunteers on Christmas Day! Louise, thank you so much for your detailed reply!